In all my work I am interested in following a very simple system which is devised prior to execution and cannot be deviated from during the course of production. There is an abandonment of color, of gesture, of the expressive, and instead I instate an almost mechanistic methodology that minimizes the decision making process and emphasizes a systemic approach. In this respect the work can be seen more as a result, bounded by a set of rules as opposed to something derived from an intuitive, responsive operation. Although aesthetically, the work appears almost machined, they are very much hand made objects, obsessively labored and crafted. 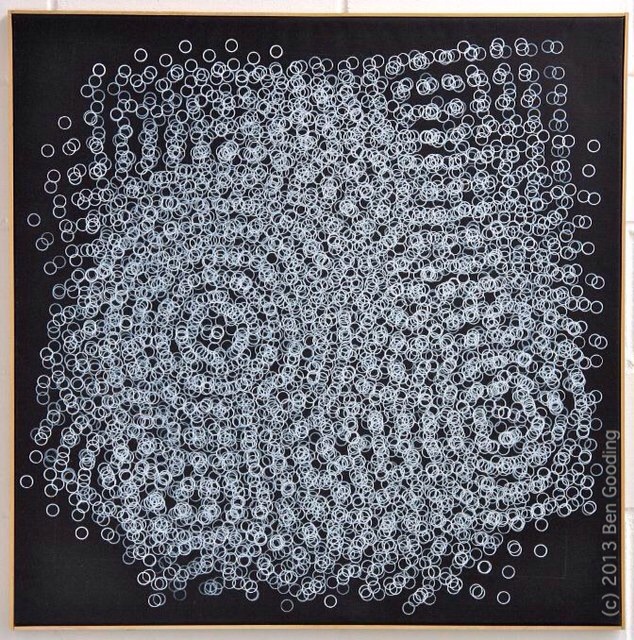 I love the drama of this piece and how the groupings of circles create even larger implied circles. We usually see black and white art as photography or pen & ink drawings. Here Ben used acrylic paints to demonstrate another way to use black and white as a form of artistic expression. While I’ve done pen & ink mandalas…I have yet to paint a white on black one. I’m inspired. How about you? Have you played with only using black and white? Feel free to share.